Sometimes, less is more. Sean's singular grind rock stands tall on the strength of only two pillars: keyboardist Luke Laplante and drummer Mike Peterson. Named via a phonetic play on their former incarnation as “Tion” (inspired by the prevalence of said suffix among death metal bands, SuffocaTION, IncantaTION, etc. 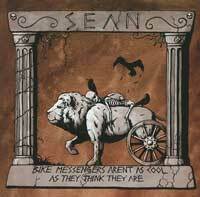 ), Sean has followed up their well-received first release (“Singers Ruin Perfectly Good Bands”) with another contentiously titled EP: “Bike Messengers Aren’t As Cool As They Think They Are." Features Members of Seattle horror punk legends The Accused and Scary Bear.